Britain’s forestry experts say there is no need to close woodland to walkers and outdoor enthusiasts following outbreaks of the deadly ash dieback fungus. The Forestry Commission today issued new advice to anyone visiting woods infected with Chalara fraxinea, or areas suspected of being affected. But it emphasised it is not closing its forests, nor is it advising owners of infected sites to do so. Guidance for visitors to areas known or suspected of being hit by the fungus is not to remove any plant material from the site, such as cuttings, firewood, sticks or leaves. Where possible, the commission said, before leaving the woodland, walkers and outdoor enthusiasts should clean soil, mud, leaves and other plant material from footwear, clothing, dogs, horses, the wheels and tyres of bikes, baby buggies, carriages and other vehicles, and remove any leaves which are sticking to their car. Before visiting other countryside sites, parks, garden centres and nurseries, people should thoroughly wash footwear, wheels and tyres in soapy water, and while in forest and woodland, they should follow the instructions on any signs. And bosses in a national park today appealed to anyone who has planted ash trees in the past six years to contact them. The Peak District National Park Authority also asked landowners not to choose ash in any new tree-planting schemes. 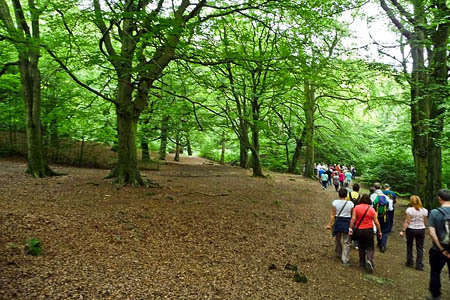 The authority added that access to woodlands in the national park is completely unaffected, but visitors should follow the precautions listed by the Forestry Commission. Seven limestone dales in the national park contain some 900ha (2,224 acres) of ash woodland. They include landscapes such as Lathkill Dale, Dovedale, Monsal Dale and the Manifold and Wye Valleys, which would be changed forever by a serious outbreak of the disease. The woodlands, designated an internationally important special area of conservation, support a profusion of wild flowers, insects, mammals and birds, which would in turn be devastated. Jane Chapman, head of environment and economy for the Peak District National Park Authority, said: “The Peak District national park is open for business and people should continue to enjoy the area as normal. “This is a serious disease and if it took hold in our woodlands it would change some of our most iconic landscapes irreversibly. “No cases have been found in the Peak District, but if we are going to get an outbreak, new trees are the most likely source of infection. For this reason we’re asking anyone who has planted any ash trees in the national park in the last six years to contact us, be they individual trees or part of a larger planting scheme. People who have planted ash in the past six years should call the authority’s customer service on 01629 816200 or email them, giving their name, contact details and the site location. Meanwhile, if people suspect any cases, they should check the symptoms through the Forestry Commission’s website. As Chalara is windborne fungal spore there was never any point in closing off forests. It will probably spread throughout UK whatever we do but avoiding transplanting it from diseased stock might help slow this down. It will also probably kill all affected trees. Eventually evolution will operate and resistant strains will arise/flourish in affected areas but there might be a sad gap before those strains give healthy mature trees. "Where possible, the commission said, before leaving the woodland, walkers and outdoor enthusiasts should clean soil, mud, leaves and other plant material from footwear, clothing, dogs, horses, the wheels and tyres of bikes, baby buggies, carriages and other vehicles, and remove any leaves which are sticking to their car"
The notion that the above can be cleaned effectively is complete and utter nonsense. It seems the sacred cow of access comes before the possible destruction of our ash trees.